Halloween is here and the parties are everywhere. Well, at least the excuse to have a party is here, no one dresses up for Halloween, at least not the students. We went to English Corner dressed up for Halloween to find a hundred students dressed up in their regular clothes. When one of my students saw my costume, he said, "You should dress up more." I asked him where his costume was and he replied, "I can't buy a costume in China, they're only in America." Kanyon enjoyed the students but enjoyed the balloons even more. When we first arrived, he was ready to wave hello and take pictures, but he soon discovered that he could use a balloon like a volleyball. He chased the balloon around until it was time to leave. When he popped his balloon (he popped 2), students quickly ran to find a replacement balloon. 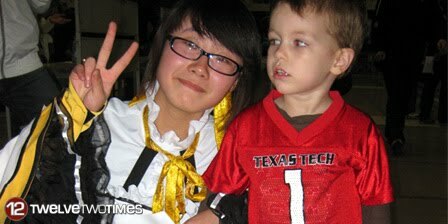 At this Halloween party, students organized "games" to play. When you think of games, delete all thoughts of traditional American fall festival games like bobbing for apples, and instead think of English language games. Tongue twisters, English movie guess, bingo, and of course karaoke. And still insists he sees the ghosts." Fun times! We have yet another Halloween party on Sunday.